In particle physics, fermions are a group of elementary (or fundamental) particles that are the building blocks of matter. 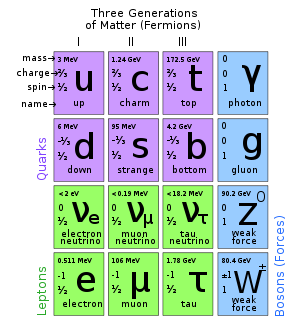 In the Standard Model, elementary particles are classified as fermions and bosons. Fermions are usually related with matter, whereas bosons are related with fundamental forces (or radiation). Fermions are subdivided into quarks and leptons. Quarks are fermions that couple with a class of bosons known as gluons to form composite particles such as protons and neutrons. Leptons are those fermions that do not undergo coupling with gluons. Electrons are a well-known example of leptons. Fermions come in pairs, and in three "generations." Everyday matter is composed of the first generation of fermions: two leptons, the electron and electron-neutrino; and two quarks, called Up and Down. Fermions obey what is known as "Fermi-Dirac statistics" and are named after Enrico Fermi. In theoretical terms, one major difference between fermions and bosons is related to a property known as "spin." Fermions have odd half-integer spin (1/2, 3/2, 5/2, and so forth), whereas bosons have integer spin (0, 1, 2, and so forth). (Here, "spin" refers to the angular momentum quantum number.) Fermions obey Fermi-Dirac statistics, which means that when one swaps two fermions, the wavefunction of the system changes sign. Given that each fermion has half-integer spin, when an observer circles a fermion (or when the fermion rotates 360° about its axis), the wavefunction of the fermion changes sign. A related phenomenon is called an antisymmetric wavefunction behavior of a fermion. As particles with half-integer spin, fermions obey the Pauli exclusion principle: no two fermions can exist in the same quantum state at the same time. Thus, for more than one fermion to occupy the same place in space, certain properties (such as spin) of each fermion in the group must be different from the rest. The operation of the Pauli exclusion principle is used to explain the "rigidness" or "stiffness" of ordinary matter (contributing to the Young modulus of matter), and the stability of the electron shells of atoms (thus the stability of atomic matter). This principle is also responsible for the complexity of atoms (making it impossible for all atomic electrons to occupy the same energy level), thus making complex chemistry possible. In addition, this principle is said to be responsible for the pressure within degenerate matter, which largely governs the equilibrium state of white dwarfs and neutron stars. In large systems, the difference between bosonic and fermionic statistics is apparent only at high densities, when their wave functions overlap. At low densities, both types of statistics are well approximated by Maxwell-Boltzmann statistics, which is described by classical mechanics. As noted above, elementary particles are classified as fermions and bosons, and elementary fermions are subdivided into quarks and leptons. When quarks are coupled together, they form composite fermions such as protons and neutrons. Leptons include the electron and similar, heavier particles (muon and tau) and neutrinos. The known fermions of left-handed helicity interact through the weak interaction, but the known right-handed fermions do not. Or, put another way, only left-handed fermions and right-handed anti-fermions couple to the W boson. There are 24 fundamental (or elementary) types of fermions, referred to as fermionic "flavors." They consist of 12 quarks and 12 leptons, as listed below. A meson contains two fermion quarks and is a boson. The nucleus of a carbon-12 atom contains six protons and six neutrons (all fermions) and is also a boson. A baryon contains three quarks and is therefore a fermion. The number of bosons within a composite particle made up of simple particles bound with a potential has no effect on whether the composite particle is a boson or a fermion. In a quantum field theory, the situation is more interesting. There can be field configurations of bosons that are topologically twisted. These are coherent states that behave like particles, and they can be fermionic even if all the elementary particles are bosons. This situation was discovered by Tony Skyrme in the early 1960s, so fermions made of bosons are named Skyrmions. Fermionic or bosonic behavior of a composite particle (or system) is seen only at large distances (compared to the size of the system). At proximity, where spatial structure begins to be important, a composite particle (or system) behaves according to its constituent makeup. For example, two atoms of helium cannot share the same space if it is comparable by size to the size of the inner structure of the helium atom itself (~10−10 m)—despite bosonic properties of the helium atoms. Thus, liquid helium has finite density comparable to the density of ordinary liquid matter. The following table is based in part on data gathered by the Particle Data Group. * These are not ordinary abelian charges, which can be added together, but are labels of group representations of Lie groups. ** Mass is really a coupling between a left-handed fermion and a right-handed fermion. For example, the mass of an electron is really a coupling between a left-handed electron and a right-handed electron, which is the antiparticle of a left-handed positron. Also neutrinos show large mixings in their mass coupling, so it's not accurate to talk about neutrino masses in the flavor basis or to suggest a left-handed electron antineutrino. *** The masses of baryons and hadrons and various cross-sections are the experimentally measured quantities. Since quarks can't be isolated because of QCD confinement, the quantity here is supposed to be the mass of the quark at the renormalization scale of the QCD scale. **** The Standard Model assumes that neutrinos are massless. However, several recent experiments have shown that neutrinos oscillate between their flavor states, which could not happen if all of them were massless. It is straightforward to extend the model to fit these data, but there are many possibilities, so the mass eigenstates are still open questions. ↑ The spin-statistics theorem identifies the resulting quantum statistics that differentiates fermions from bosons. ↑ Martinus Veltman, Facts and Mysteries in Elementary Particle Physics (River Edge, NJ: World Scientific, 2003, ISBN 981238149X). ↑ Fermions and Bosons The Particle Adventure. Retrieved September 9, 2008. ↑ W.-M. Yao et al. (Particle Data Group) (2006), Quarks J. Phys. G 33:1. Retrieved September 9, 2008. ↑ B. Kayser (Fermilab) (Sep. 2005), Neutrino mass, mixing, and flavor change Particle Data Group. Retrieved September 9, 2008. When bosons behave like fermions physicsworld.com. The Review of Particle Physics Particle Data Group. This page was last modified on 6 April 2017, at 16:13.